Hello Amanda – Thank you for taking part in this interview for Natsreadingcloud. Would you like to start by introducing yourself to my readers..? Hello readers! My name is Amanda Prowse; I am a 47-year-old wife and mum who lives in the West country. I started writing later in life when I was diagnosed with cancer and it made me rethink my life plan! What did I really want to do with whatever life I have left? The answer was write stories! So I gave it a go and am delighted to see my 8th novel hitting the shelves, I feel like the luckiest girl in the world. Can you tell us a bit about Perfect Daughter? What kind of research did you do for perfect Daughter? I lived with my mum while she was caring for us, her grandchildren and her mum, my lovely Nan, who had dementia. It made me aware of the struggle and exhaustion of this life. I also spoke to many women, strong, inspirational, devoted women who never, ever put themselves first, bloody hero’s each and every one. Do you have a favourite book you have written from all nine? I do! I have two if that’s allowed! I love Perfect Daughter and also Clover’s Child, as it is set in the 1960’s and I love the music and social scene of that era, I listened to a lot of great music while writing it. The book is also set in Limehouse in Ropemakers Fields in the actual house that my great gran and my Nan grew up in, and features the docks where my grandad worked. It was lovely to re-visit them in the places they knew and loved. Who are your favourite Authors? And what genre of books do you enjoy reading? The simple answer is any and all – I read everything, can’t bear not to have a stack of books waiting to escape into. But specifically I love Isabel Allende, Jodi Picoult, Joanne Harris, I could go on… and as for genre, anything with a strong female voice and a good story grips me, no matter under what genre it falls. What is the best thing about being a writer? I think it’s the feeling that I am doing something I love and never thought I would or could! I’m an ordinary woman from a very ordinary family, a bit fat, a bit clumsy, a bit rubbish at most things, but I can do this one thing; write books, and for that I am grateful each and every day! I understand you are a ambassador of the Sepsis Trust please tell us more about the their good work. Sepsis Trust are an amazing charity and I am so proud to be an ambassador for them. I am ashamed to say I had only vaguely heard of Sepsis and didn’t really know what it was and yet it kills more people every year in the UK than Breast, Prostate, Bowel cancers, road accidents and AIDS combined! 37,000 a people a year, and globally every 3.5 seconds someone in the world dies of Sepsis. We need to start making people more aware and you can check out the website sepsistrust.org to find out more! And finally – have you started writing your next book? You are very, very welcome. Jackie Morgan loves her family. Even though her teenage children can be stroppy, her husband a little lazy and providing round-the-clock care for her mother who suffers from Alzheimer’s is exhausting, they are her entire world. She has sacrificed a great deal to provide this safe and loving home, in their cramped but cosy semi with a view of the sea, and her own dreams have been firmly pushed to one side. All Jacks wants is for her children to have a brighter future than she did. As long as Martha, the eldest, gets into university and follows her dreams, all her sacrifice will be worth something… won’t it? 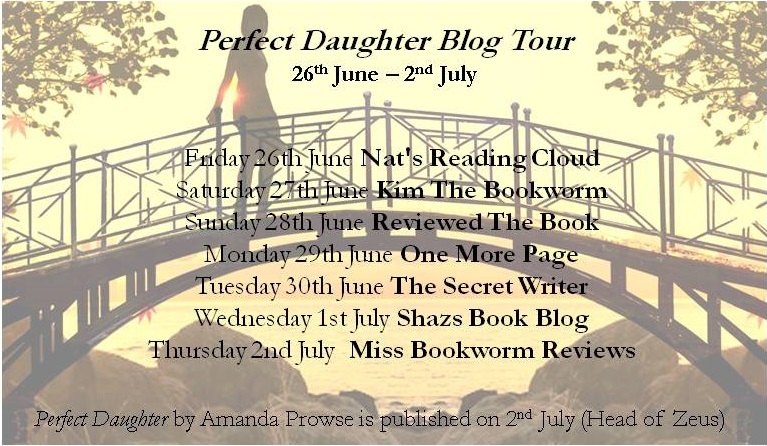 For fans of Jojo Moyes and Jodi Picoult, Perfect Daughter confronts current issues such as Alzheimer’s and the pressures of being a ‘sandwich mother’ – women caring for both their parents and children simultaneously. According to Carers UK there are over 6.5 million carers in the UK and they predict this figure will rise to 9 million by 2030. Amanda felt inspired to confront this issue in Perfect Daughter, after watching her mother care for her grandmother who was suffering from dementia, whilst also looking after her own children and grandchildren. Amanda Prowse is a bestselling novelist with an incredible 155k followers on Twitter. On Remembrance Day 2012 Amanda Prowse made headlines with her debut novel Poppy Day. She received widespread military support, celebrity endorsements and appeared in newspapers and on TV sofas everywhere. Amanda donated all her author royalties to the Royal British Legion’s Poppy Appeal. This was followed by 4 more novels ‘ Clover’s Child’, ‘What Have I Done’, ‘A Little Love’ and ‘Will You Remember Me?’. As well as writing she was Writer in Residence on ITV’s This Morning in 2013. Amanda now has seven novels and a number of short stories under her belt, including the no 1 bestselling What Have I Done? Most recently, Amanda penned the critically acclaimed A Mother’s Story, which dealt with the issue of post-natal depression. Amanda is an ambassador of The Sepsis Trust. Sepsis kills more people in the UK than breast, bowel and prostate cancers combined – over 37,000 people with a cost to the NHS of £2.5 billion a year. Sepsis is a life threatening condition that arises when the body’s response to an infection injures its own tissues and organs. In September this year, Amanda will release a book called ‘Three and a Half Heartbeats’ and all profits from the novel will go directly to the Sepsis Trust. Amanda is married with two children. They live near Bristol.